Donetsk airport was a showpiece of Ukraine's progress, but today it lies in tatters. ITV News is the first UK broadcaster to gain access. Video shows a child's incredibly lucky escape after a large glass panel smashed to the ground during shelling of Donetsk's Donbass Arena. Only membership of NATO would enable Ukraine to defend itself from external aggression, Ukrainian Prime Minister Arseny Yatseniuk said. Speaking at a conference in Kiev attended by Ukrainian and European lawmakers and business leaders on Saturday, Yatseniuk made clear he did not view the ceasefire as the start of a sustainable peace process because of Putin's ambitions. We are still in a stage of war and the key aggressor is the Russian Federation ... Putin wants another frozen conflict (in eastern Ukraine). His goal is to take all of Ukraine ... Russia is a threat to the global order and to the security of the whole of Europe. NATO in these particular circumstances is the only vehicle to protect Ukraine. Ukraine is "still in a state of war" with neighbouring Russia despite a cease-fire between Kiev's forces and Moscow-backed rebels in the east, the country's prime minister said as a second convoy of Russian trucks rolled into Ukraine. Speaking at a conference with politicians and business leaders in Kiev, Arseniy Yatsenyuk said Russian President Vladimir Putin's goal is "to take the entire Ukraine". Donetsk city council said there had been fighting near the airport overnight. Two shells hit homes in the area but there were no reports of casualities. Heavy artillery has been reported across northern Donetsk in eastern Ukraine, and a large plume of black smoke has been seen by eyewitnesses, Reuters reports. Donetsk airport remains in the hands of Ukrainian government forces, while the city is controlled by pro-Russian separatists. Earlier, the Ukrainian military said the rebels had fired on their forces overnight in the area of the airport. Russian President Vladimir Putin wants to destroy Ukraine as an independent country and restore the Soviet Union, the country's prime minister claimed today. Arseny Yatseniuk also praised a new wave of economic sanctions imposed on Russia by the European Union and the United States and said they posed a major threat to the Russian economy. "We are still in a stage of war and the key aggressor is the Russian Federation ... Putin wants another frozen conflict (in eastern Ukraine)," he said at an conference in Kiev attended by European and Ukrainian politicians and business leaders. "His goal is to take the entire Ukraine ... Russia is a threat to the global order and to the security of the entire Europe," Yatseniuk added. The official monitoring mission in eastern Ukraine says it has observed mortar fire near Donetsk International Airport and exchanges of fire in the surrounding area. The Organization for Security and Cooperation in Europe monitoring mission's most recent report, from Sunday, noted "evidence of an exchange of fire close to the area of Donetsk International Airport, and in Shchastya, 20 km north of Luhansk". It also saw "numerous impacts from shelling" in nearby Spartak, and heard shelling close to the coastal city of Mariupol on Saturday night. A witness says he has heard gunfire and artillery fire near the rebel stronghold of Donetsk, Reuters reports. "A series of machinery gunfire and repeated artillery blasts can be heard from the wider area of Donetsk airport," said the reporter, who was some less than two miles from the airport. 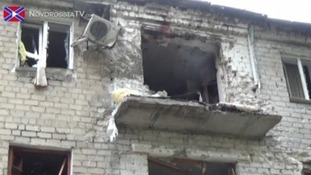 Fifteen civilians were killed after Donetsk came under more heavy shelling today, according to city authorities. People ran for shelter after shells fell on a market area of the eastern Ukrainian city. Emergency services rushed to carry away the casualties and out out fires in apartment buildings and cars. Some apartment buildings showed signs of extensive damage from two weeks of shelling as Ukrainian forces try to wrest the city from the grip of pro-Russia rebels. Local media agencies also distributed footage purporting to show civilians killed by shelling in the streets. Fifteen civilians have been killed in shelling in the east Ukrainian city of Donetsk today, the city administration said in a statement on its website which described the general situation there as "very tense".